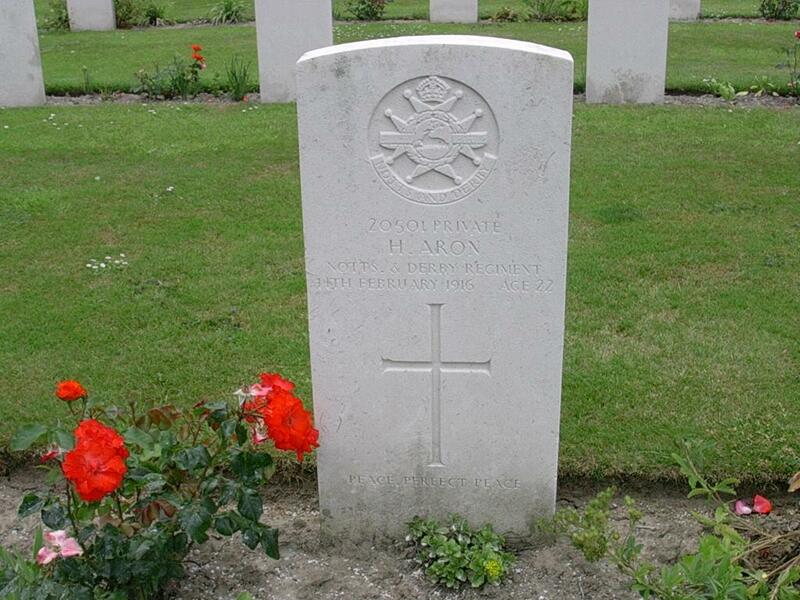 Horace Aaron was a Private in the 10th Battalion, Nottinghamshire and Derbyshire Regiment(Sherwood Foresters), Service Number 20501. He was born to Morris and Emma Aaron on 5th July 1893 and was baptised at Old Whittington on 9th November 1893, his fathers occupation was given as Forgeman. Morris came originally from North Wales and his wife Emma came from Shropshire. The recorded address in the parish register was 20 Holland Road Whittington and Horace was baptised on the same day as his sister Elizabeth Ann and his brother John James. He attended Websters Endowed Mixed School in Whittington from 12th July 1897 until 2nd January 1901 when the records show he was transferred. By 1901 according to the census the family were living at 70 Holland Road Whittington and Horace now had five siblings. His father was still working as an Ironman in a Forge. The census of 1911 shows that the family were still living on Holland Road but they are now at number 136. Horace is 17 years old and working as an Underground Pony Driver. (Pony Driving was normally the job young boys would do straight from school, before they went onto heavier work in the mines). Horace married Sarah Longson from Newbold in January 1914 and had a son, also called Horace, later that year. On 5th December 1914 Horace enlisted in the Sherwood Foresters (10th Battalion Nottingham and Derbys Regiment). When he enlisted he gave his occupation as miner, his age as 21 yrs and 6 months and his physical description shows he was 5ft 6ins and weighed 130lbs. His address at the time of enlisting was 136 Holland Road Old Whittington, it would appear that Horace and his wife were living with his parents. His regiment left Winchester for Boulogne, France via Folkestone and he arrived in France on 14th July 1915. Horace was killed on 14th February 1916. He was 22 yrs old. A newspaper report in the Sheffield Daily Telegraph, Saturday March 18th 1916 explains how Horace Aaron was killed. His regiment had been involved in heavy fighting at the Bluff, south east of Ypres as the extract below confirms. The Actions of the Bluff were local operations carried out in Flanders during the First World War by the German 4th Army and the British Second Army in 1916. The Bluff is a mound near St Eloi, south-east of Ypres in Belgium, created from a spoil heap during the digging of the Ypres-Comines Canal before the war. From 14–15 February and on 2 March 1916, the Germans and the British fought for control of the Bluff, the Germans capturing the mound and defeating counter-attacks only for the British to recapture it and a stretch of the former German front line, after pausing to prepare a set-piece attack. (Photos courtesy of TWGPP) Sadly the spelling on the gravestone is incorrect. Spoilbank Cemetery (also known as Chester Farm Lower Cemetery or Gordon Terrace Cemetery) was begun in February 1915, and used by troops holding this sector until March 1918. It is particularly associated with the casualties of the 2nd Suffolks on “The Bluff” early in 1916. It was enlarged after the Armistice when graves were brought in from the battlefields of Ypres. 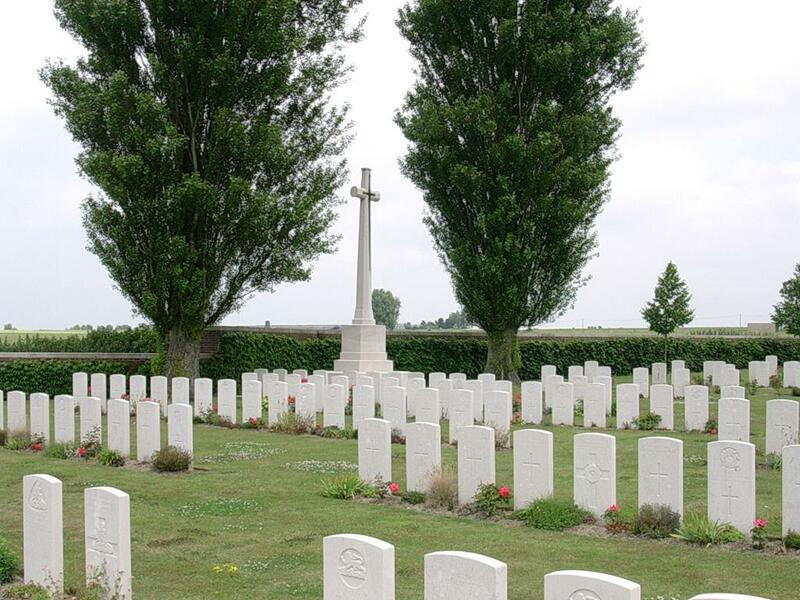 The cemetery contains 520 burials and commemorations of the First World War. 125 of the burials are unidentified and special memorials are erected to 11 casualties known or believed to be buried among them. The cemetery was designed by Sir Edwin Lutyens. One disc, One notebook, two matchboxes, two pencils, two bullets, One thimble, One cartridge case. Horace was posthumously awarded The Victory Medal, The British War Medal and the 1914/1915 Star. He is commemorated on Old Whittington, The Brushes and Newbold War Memorials and the Sherwood Foresters Roll of Honour . In 1918 Horaces widow Sarah remarried and became Sarah Whitehead and continued to live in Chesterfield. Horace, their son, married Kathleen Roxborough in 1940 at New Whittington and the entry in the local paper describes the bride being dressed ‘in white georgette with wreath and veil and carrying a shower bouquet of red carnations’. (as I have not got a copy of the death certificate this is an assumption using genealogy records only). Footnote: I have contacted the Commonwealth War Graves Commission who will look into amending Horace’s surname on the headstone at some point in the future.